Finding yourself the victim of theft is never pleasant and is all too common in Africa. My family felt that experience three times during our time in Zambia. But imagine awakening one morning to find the door of your home open, as Pastor David Oure experienced a few months ago. As the probable meaning of the open door sank in, David made a quick search. Sure enough, his phone and laptop were missing. As a pastor, these are crucial tools in caring for a church and preparing sermons. In addition to the stolen items, David felt the trauma of knowing the thieves had been in his home while he slept. As you can imagine, this disturbed his sleep for some time. 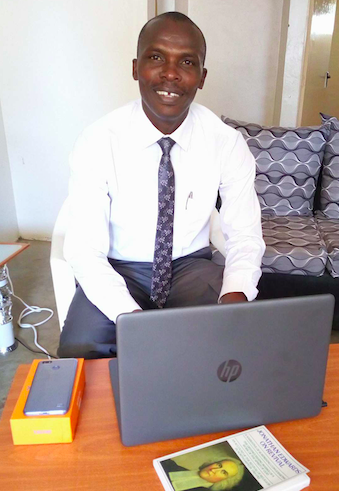 David had recently relocated to Kisumu, Kenya after a year of pastoral internship in Eldoret with Pastor Naphtally Ogallo. David moved to Grace Baptist in Kisumu in preparation to take over the pastorate of the church when Sam Oluoch moves to Nairobi to start a new church. Despite the unpleasant welcome to Kisumu, David has settled in nicely, has married a wonderful wife from Naphtally's church, and has earned the respect of the church in Kisumu. Thanks to the giving of our donors, HeartCry was able to replace David's phone and laptop, and steps have been taken to prevent future theft.